"Out of the Past", Fairfax Cable's oldest running public access TV show continues it's series on the early days of Washington's radio and TV industry with this past Saturday's featured guest Ed Walker. Walker has been a major performer on the Washington scene since the early 50's, and is still going strong with his very popular The Big Broadcast show on WAMU radio every Sunday night. 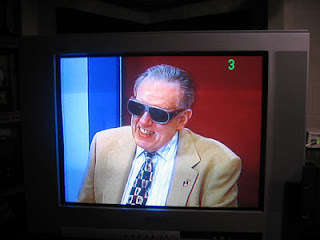 Walker described his first meeting with Willard Scot and how that developed into a lifelong friendship and partnership as THE JOY BOYS, perhaps the most memorable and long running radio show in local history.